CORONADO — A grand opening celebration was held Sept. 27 for the new Coronado Club Room and Boathouse, giving the public access to the new 5,000-square-foot facility located at 1985 Strand Way, on Glorietta Bay. 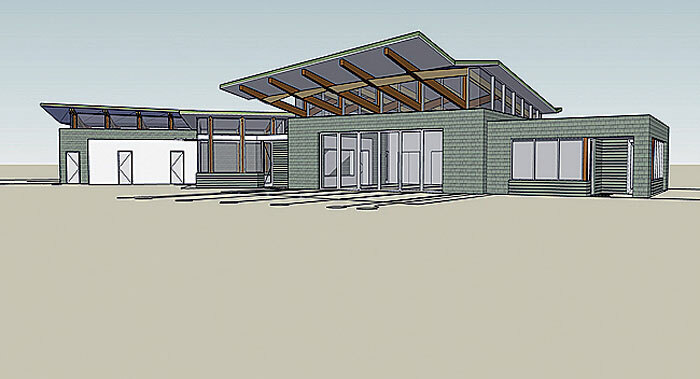 The new club room provides the community with space for local youth programs, and the boathouse will be used to store non-motorized watercraft. Built with environmentally sustainable materials, the new facility is Leadership in Energy & Environmental Design (LEED) certified. The certification is a national recognition that ensures the facility was designed with sustainable materials and uses less water and energy. Board of Port Commissioners chairman Lou Smith participated in the grand opening event and ribbon-cutting ceremony, joined by Coronado Mayor Casey Tanaka, Coronado City Council members and members of the community. At the event, a public artwork by sculptor Kim Ogburn was dedicated. Titled “Sea Level,” it depicts an above-and-below-water look at an artistic kelp forest. The artwork was first unveiled in the Port of San Diego’s Urban Trees 7 public art program, and was displayed on the North Embarcadero area of San Diego Bay during 2011. The city of Coronado purchased the artwork from the artist and recently installed it in front of the Club Room and Boathouse. The Port of San Diego contributed $1.5 million for the Coronado Club Room and Boathouse project through its capital improvement program. The facility includes boat storage, a multipurpose club room, a classroom, a kitchen, administrative office space and public restrooms. Vessels will be available for rent, and there will be instructional classes in kayaking, stand-up paddleboarding, rowing and sculling, outrigger paddling and boating safety. In addition to the ribbon-cutting event, the city hosted a grand opening festival Oct. 6, where visitors were able to try kayaking and stand-up paddleboarding. A “Paddle-in Movie” was shown that night: The animated film “Pirates! Band of Misfits” was shown on a big screen in front of the boathouse. More movies are planned in the future, and experienced kayakers are encouraged to “paddle in” to see the movies. Applications for vessel storage spaces are now being accepted and will be assigned on a first-come, first-served basis. Applications must be submitted with a $250 deposit that will be refunded if space is not available. The boathouse is expected to be ready for boat storage by early November, and the maximum storage rental period is two years. At the end of two years, vessels must be removed; however, renters may request that their names be added to the bottom of the wait list. For more information on these events, or to learn more about the Coronado Boathouse and Club Room, go to coronado.ca.us or call the Coronado Recreation Department at (619) 522-7342.